Thursday, March 7th, was Crossover Day at the Capitol. With few exceptions, bills not passed by at least one chamber of the General Assembly by Crossover Day are dead for the current legislative session. With the 40th and final legislative day set for April 2, here's the status of the 2019 priorities of the Georgia Council on Aging and CO-AGE. *Meals on Wheels Georgia House added $460,277 to Gov. Brian Kemp's recommendation, bringing total funds to $1.4 million for 2020. The 2019 amended budget includes $250,00 extra for Meals on Wheels. This budget has been signed by the governor. Study committee on housing options This measure will create a House-only committee and will be heard in the House Human Relations and Aging Committee after being introduced and assigned a bill number. The goal is to look at financial options, including Medicaid funding of Assisted Living for low-income seniors. Elder abuse HB 246 and HB 247 are elder abuse bills that the council and CO-AGE are supporting. House Bill 246 has passed the House and is in the Senate Judiciary Committee. House Bill 247 also made the calendar, clearing the House 170-1. Personal care home safety GCOA has given state regulators suggested updates to fines and sanctions for violations in personal care homes. Advocates for the elderly are praising Gov. Brian Kemp for proposing funding that could make a difference for 1,000 of the 7,000 older Georgians on waiting lists for home and community services. Kemp’s FY 2020 budget proposal, unveiled Thursday, includes an extra $1,898,000 for a state program that helps the elderly stay in their communities. Also in response to the waiting lists for Meals on Wheels at the Area Agencies on Aging across the state, Kemp’s budget includes $945,955 for meals for these seniors. “We are so grateful to the governor for his insight and budget recommendation,” Vicki Johnson, chair of the Georgia Council on Aging, said late Thursday. “Not only is this the most cost-efficient way of helping our elderly citizens, but it also allows them to stay in their homes where they prefer to be.” The state Home and Community-based Service (HCBS) program provides help for eligible elderly Georgians with tasks, such as bathing and dressing, transportation to doctors, and home-delivered meals. In Fiscal Year 2017, about 34,000 Georgians received HCBS assistance, a 9.9 percent increase from the previous year thanks to budget increases. About 7,000 seniors currently are on waiting lists for these services, according to data from the Georgia Council on Aging. The Council and the 900-plus member Coalition of Advocates for Georgia’s Elderly (CO-AGE) are making extra funding for HCBS their top priority for the 2019 legislative session. The costs to provide home and community-based care is about one-tenth of the costs of nursing home care, Johnson said. “It’s far less expensive than the alternatives, and it’s giving our seniors and their families an option they want and need,” she said. Kemp’s budget recommendations have to be approved by the Georgia General Assembly and would be valid for the fiscal year that starts July 1. Kemp’s budget also includes $338,802 for Georgia’s Aging and Disability Resource Connection (ADRC). The Council and CO-AGE had asked for a $4 million increase in state funds. The centers, located throughout the state, provide information and referral services to older Georgians about private and public help that’s available. More than 95,000 Georgians received assistance through the centers in Fiscal Year 2017 from more than 26,000 community-based providers. Also included in Kemp’s budget are funds for Adult Protective Service and Public Guardianship workers, for a total of $1,323,839. These crucial public servants help protect Georgia’s vulnerable at-risk adults. · Providing affordable housing for people who need help with daily living activities, such as meals, medications, dressing, and bathing. · Strengthening penalties and sanctions for personal care homes that do not comply with existing regulations. The Georgia Council on Aging honored Sandy Hodson with a Special Contribution Award before an enthusiastic crowd of over 110 people at the Coalition of Advocates for Georgia’s Elderly July meeting. The annual meeting took place on Thursday, July 12, at the Methodist Children’s Home in Macon, Georgia. Hodson was recognized because of her diligent coverage of elder abuse issues in the Augusta area especially unlicensed personal care homes. The Georgia Council on Aging named Representative Sharon Cooper, R-Marietta, as the 2018 Legislator of the Year before an enthusiastic crowd of over 110 people at the Coalition of Advocates for Georgia’s Elderly meeting. The annual meeting took place on Thursday, July 12, at the Methodist Children’s Home in Macon, Georgia. Atlanta, GA (March 29, 2018) – The Georgia Council on Aging and CO-AGE (Coalition of Advocates for Georgia’s Elderly) hailed the passage of several pieces of legislation that will help make Georgia’s older adults and other vulnerable populations safer. In contrast the Council is disappointed in the lack new funding for Home and Community Based Services and the Aging and Disability Resource Centers in the budgets adopted by the General Assembly. Nearly 13,000 people called for help on the Northwest Georgia Area Agency on Aging hotline in the past 12 months, the director testified in Atlanta Thursday. Lynn Reeves spoke to the House Appropriations health and human resources subcommittee chaired by Rep. Katie Dempsey, R-Rome. Reeves and Maureen Kelly, legislative liaison for the Georgia Council on Aging, are seeking an additional $14 million in the state's 2019 budget. (Atlanta, GA, February 2, 2018) – In his groundbreaking book The Tipping Point, Malcolm Gladwell describes connectors as “people who link us up with the world. People with a special gift for bringing the world together.” Mrs. Eunice Mixon of Tifton, Georgia is such a connector, and next week, on February 8, the Georgia Council on Aging will honor her as the Distinguished Older Georgian for 2018. Both houses of the General Assembly will pass resolutions recognizing her contributions to the state and to South Georgia, and friends and family will join her for a reception in her honor at 2 p.m. in the capitol rotunda. A life-long resident of Tift County, Miss Eunice, as she is called affectionally, was born to Robert and Carrie Lastinger and later married Albert Mixon. Together the couple started a farm where Miss Eunice was the top hand, cultivating the soil and feeding the farm workers. As technology replaced most of her efforts on the farm, Miss Eunice remembered her old ambition to teach. She started school at Abraham Baldwin Agricultural College and a few summers later had earned a master’s degree and a specialist in science education from the University of Georgia. Mrs. Mixon’s first official foray into state politics came in 1974 when she became Tift County campaign chair for soon-to-be-Governor George Busbee. That’s when her experience feeding the farm hands really proved itself as she hosted dinner parties for large groups, either for fun or to get to know people from different parts of the state, a practice she continued for many years. Mrs. Mixon said her parents taught her one important lesson that has guided her life in politics – that intelligent, well meaning, loving people can disagree. A person is not "evil" just because they view things differently.” You don't vote against some body because they're an evil person,” she says. “You vote against somebody because in your opinion, their ideas are not as good as the others running." Over the years Mrs. Mixon served on some 15 boards and commissions and volunteered for countless election campaigns for presidents, senators and governors, always with her trademark parasol. Among her many recognitions, she raised more than $25,000 for Alzheimer’s by dancing the waltz and was named one of 25 women for the 21st Century by the Georgia House (along with other distinguished Georgia women such as Coretta Scott King and Rosalyn Carter). She received the inaugural Eunice L. Mixon Award created by the State Bar of Georgia and was recognized as one of the 40 most influential South Georgians. Following the death of her husband in 1998, she spent 12 years working with the General Assembly as doorkeeper. The Distinguished Older Georgian Award was created in January 2003 by the Georgia Council on Aging to honor a Georgian 80 years of age or older recognized as a role model for positive aging who has made significant contribution to society through occupational or volunteer efforts. The Georgia Council on Aging (GCOA) was created by the Georgia General Assembly in 1977 to advise the governor, assembly, and state agencies on matters relating to Georgia’s seniors. Members of the 20-person council, drawn from every region of the state, also advocate for aging Georgians and their families and make recommendations to lawmakers and agencies on programs for seniors. (Atlanta, GA – February 1, 2018) – On February 7-8, nearly 600 older adults from all over Georgia will go to the Georgia Capitol to meet with their legislators. 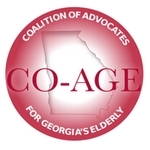 The meetings are part of Senior Week, held annually by the Georgia Council on Aging and CO-AGE (the Coalition of Advocates for Georgia’s Advocates) to focus attention on the needs of Georgia’s seniors. The theme of the week is “Stretching Dollars for Seniors,” reinforcing the message that programs such as Home and Community Based Services (HCBS) and the network of Aging and Disability Resource Centers (ADRCs) are cost-effective investments that enhance the quality of life for older Georgians and persons with disabilities while saving the state money. The advocates will seek to persuade lawmakers to include additional resources in the state budget -- $10 million for Home and Community-Based Services and $4 million for the Aging and Disability Resource Centers, both CO-AGE priorities for 2018. In addition, these volunteers will seek support for two issues that will help keep seniors safer -- tougher penalties for personal care homes that fail to comply with state regulations and a statewide registry of individuals who have a history of abusing vulnerable adults. These four issues were adopted by CO-AGE members as their legislative priorities last summer during their annual meeting in Macon. ADRC funding is particularly critical this year. Until now, Georgia has funded the program through two federal grants. Yet, this funding has now run out. Without an allocation in the state budget, it is likely that services will have to be cut. Those cuts would be potentially devastating. Last year some 92,000 Georgians called their local ADRC for help in navigating the complex array of services and programs for older adult or persons with disabilities. Further, the program is very cost-effective and a great investment in Georgia’s elderly and disabled. In the last three years some 75 to 80 percent of callers have been diverted to private pay resources or given info only. Atlanta, GA (January 11, 2018) – Governor Deal released his Amended 2018 and his 2019 budget proposals today which include existing funding for services and programs for Georgia’s older adults. While these funds will help Georgia’s senior population, they fall short of what would be required to meet the needs of the growing numbers of older adults who want to remain at home. By 2040 one Georgian in five will be age 60 or older. This explosive growth has strained existing systems designed to help keep seniors in their homes. Right now, there is a waiting list of more than 12,000 individuals who have need services. Without additional funds, that list will only get longer, and more people will have to go into nursing homes, where their care will be much more expensive. CO-AGE priorities for 2018 include $10 million for in-home services, $4 million for the Aging and Disability Resource Centers (ADRCs), a registry of those individuals with a record of elder abuse, stricter regulation of personal care home and more options for assisted living for low-income seniors. Funding for ADRC is particularly important. These centers provide information and referral services to older adults and persons with disabilities to help them navigate complex public and private programs to get the help they need. The increase in the older population and the end of two federal grants have created a crisis in funding for the ADRC. From FY 2016 to FY 2017 the ADRC funding decreased by 9 percent. Funding of $4 million would strengthen the ADRC statewide network by adding capacity to meet the growing demand for crucial information.